Input is a set of (x, y) coordinates of plants. Suppose A with the coordinates (xA, yA) is the plant with the least ycoordinate. M11 starts from point (0,yA) heading towards plant A. Notice that the solution path should not cross itself and all of the turns should be counter-clockwise. Also note that the solution may visit more than two plants located on a same straight line. The first line of the file is M, the number of test cases to be solved (1 ≤ M ≤ 10). For each test case, the first line is N, the number of plants in that test case (1 ≤ N ≤ 50), followed by N lines for each plant data. Each plant data consists of three integers: the first number is the unique plant index (1..N), followed by two positive integers x and y representing the coordinates of the plant. Plants are sorted by the increasing order on their indices in the input file. Suppose that the values of coordinates are at most 100. Output file should have one separate line for the solution of each test case. 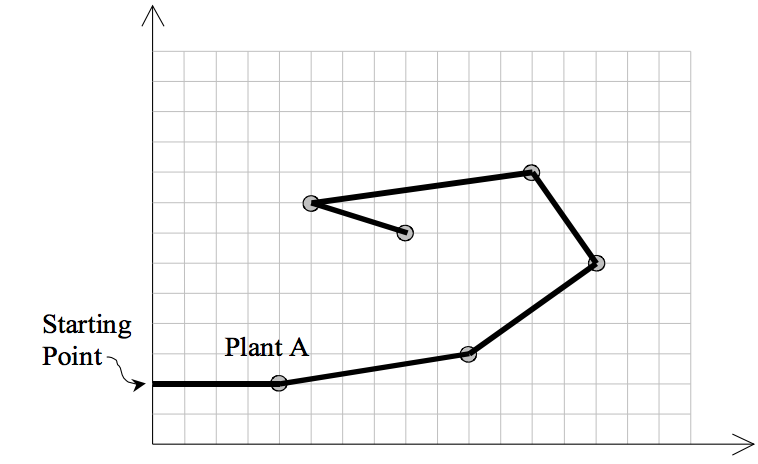 A solution is the number of plants on the solution path, followed by the indices of visiting plants in the path in the order of their visits.